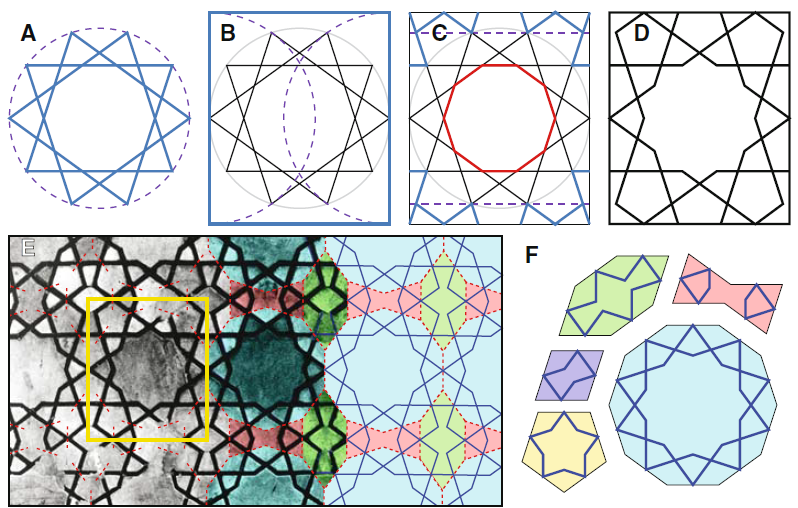 In march 2007 Peter J. Lu (Harvard) and Paul J. Steinhardt (Princeton) published a remarkable article in Science titled “decagonal and Quasicrystalline Tilings in Medieva Islamic Architecture”. The conventional view holds that the patterns in Islamic architecture were drafted with a straightedge and a compass. In pictures A to D you can see such a construction starting from a ten pointed star. The autors suggest that by 1200 AD a breakthrough occured in which a set of tiles were used to conceive the tesselations. Picture E shows on the right how the same pattern is constructed, just by the placement of these tiles, decorated with zigzagging lines. These tiles are named girih tiles, after the Persian word for 'knot'. Girih tiles are easy in use and give the decorators great freedom in conceaving apparently complex tilings. Picture F shows the 5 tiles and their decorative pattern of lines.